Anyong haseyo (pronounced Ahn-yo-ha-say-yoh)! Korean beauty is the mania these days, everyone is all agog with the perfect, glowing, white skin of the oppas and unnies. 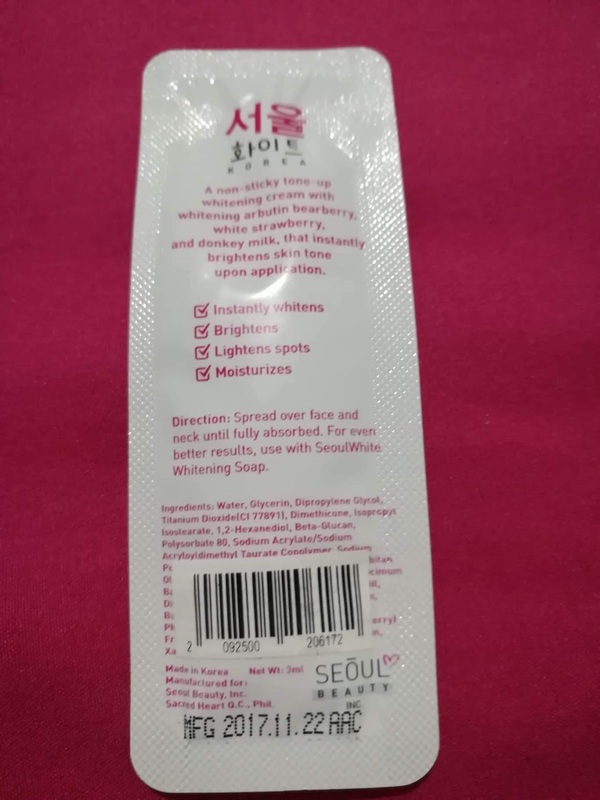 While browsing over the internet, I came across this product Seoul White Korea, I looked it up and learned it is sold at Watsons. After enjoying the sweltering heat of summer in the beaches, my natural morena skin became darker and duller. I'm not after achieving a fair complexion like the Koreans, what I want is to bring back the color of my skin to its natural glory in the shortest time. So, my midlife women- sisters, let us try these beauty products and see if we can incorporate it into our daily skincare routine. I visited a Watsons store near our house and went directly to the skin care racks but no Seoul White Korea in sight, so I walked over at the other side of the store and there I saw my Seoul White Korea! 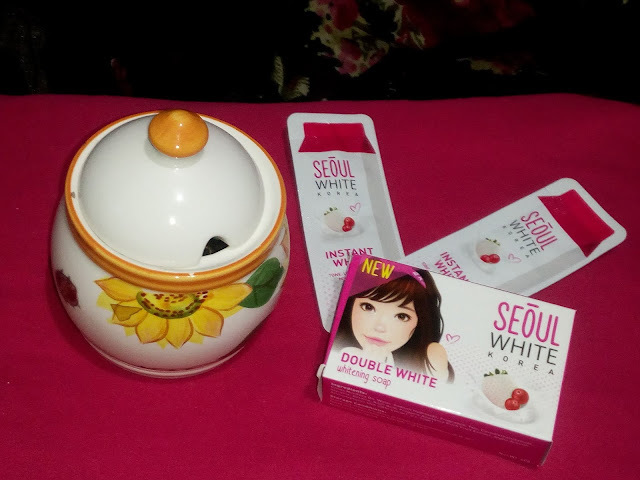 There were Seoul White Korea Soap and Seoul White Korea cream in tube and sachet. I took down the bar of soap and read the description at the back and what caught my attention are these words: helps lighten acne marks and double whitening. When I read that, I said to myself that this product may suit me very well because Filipinas has a natural darker hue than Koreans, therefore, I'll get fairer in no time at all and my new unsightly acne marks will be gone. But that is getting ahead of the story! First, what got me excited to buy the Seoul White Korea products are their prices, get ready for this. 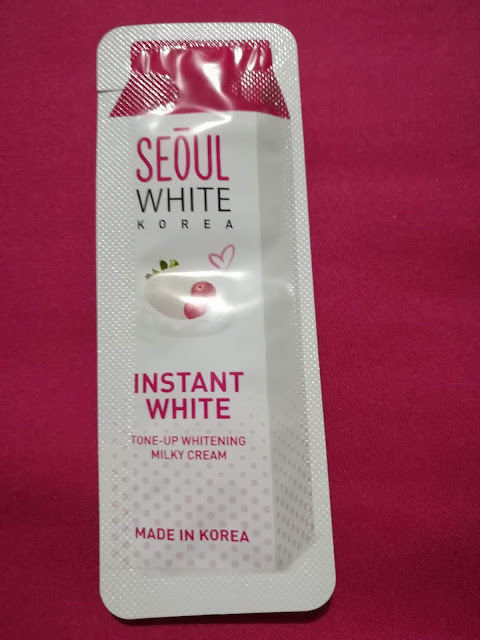 The price of the Seoul White Korea cream in the sachet is only Php 13.00 per piece, ganyang kamura ng magpaputi ngayon. 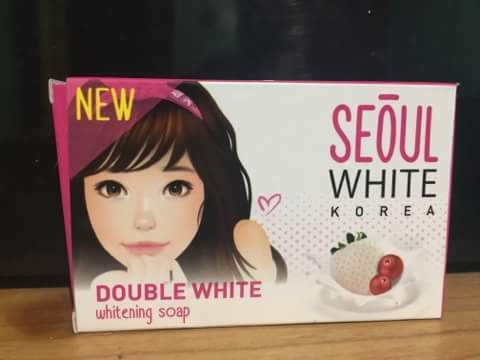 While the Seoul White Korea soap is Php 45.00 per bar. I don't remember the price of the cream in the tube because I was more interested to buy the one in sachet because it is very cheap and for testing the effectiveness of the product that price is good enough for me. So let's unmask these products and find out if it is effective and worth the price. 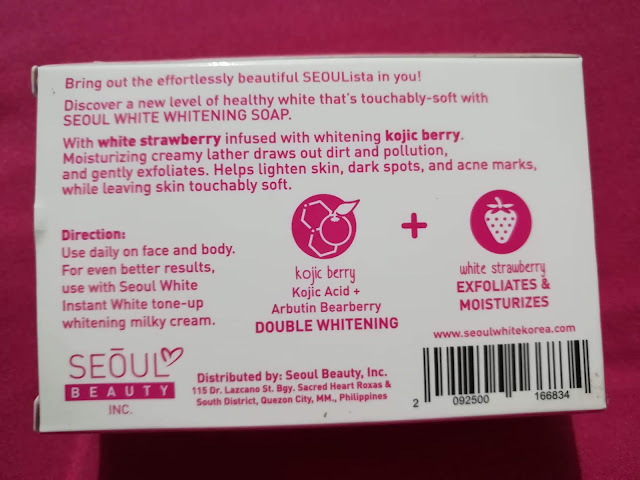 I learned that Seoul White Korea uses a blend of arbutin bearberry (the new kojic acid), white strawberry (known for its unique & magical ability to stay white even under the sun) and donkey milk ( known as "white gold" with 4x the Vit. C & more moisturizing properties than cow's milk). All their ingredients came straight from Korea, but both products are locally manufactured. Let us try the soap first. During use: on first and second use, I felt a stinging sensation, so I didn't leave the soap to linger much on my skin. After soaping my whole face up to the neck, I washed it off immediately. After succeeding use, there's no stinging sensation anymore so I took longer in lathering the soap on my face. My face feels soft & smooth even after 1 washing only. I also used the soap on the rest of my body and my body skin feels soft & smooth too. Product: Seoul White Korea, Instant White Tone-up whitening milky cream, net wt. 3ml. Before use: The sachet looks slim & sleek, easy to tear (no need for scissors), very handy especially during travels. During use: I squeezed a pea size on my forefinger & applied it on my face. It has a mild scent and the consistency of the cream is not watery & not too thick either. As I applied it over my face & neck, it instantly whitened my face but it did not appear chalky or sticky or greasy. It feels light on the skin, concealed lightly my acne marks and it seems like I applied thin dust of face powder. After 2 days of use, I notice it also exfoliated my facial skin but not my body skin. After 7 days: It drastically lightened my sunburned skin and acne marks. See the picture below. My before the picture was taken before I used the products. My after picture reveals a fairer me, I did not apply foundation or powder on my face, the cosmetics I have on are lipstick and a dab of eye shadow only. I used the soap and cream at the same time, 2x a day. I said that after I applied the cream it instantly whitened my face but the effect is not for the whole day. After 3 hours, I have to apply face powder, because my face starts to oil. My skin is naturally oily so after a few hours I really retouch with powder even before I used these products. Maybe it needs 2 - 4 weeks before achieving the full effects of these 2 products used in combination with each other. Final Verdict : The soap & cream used together indeed lightened my skin. Even my dark acne marks faded lightly. The price of the cream is very cheap, talk about value for money. The soap is quite cheap too, because the 3 in 1 pack kojic soap with net wt of 100g sells at Php 120.00. Recommendation: In a scale of 1 to 5 stars, with 5 being the highest,I highly recommend it and rate it 5 stars. 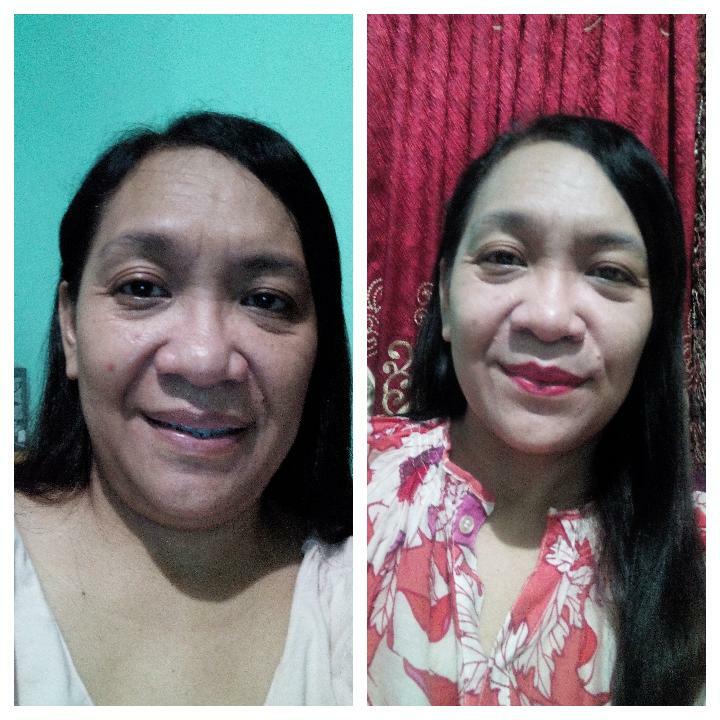 My dearies midlife women, let's take care of our skin and maybe you'd like to try these products too. The young ladies out there can benefit from these products also. If you had tried these products, care to share with the rest your experience with it. Just leave your comments below. Disclaimer: The products are personally bought by me. The product may not be apt to your personal satisfaction.